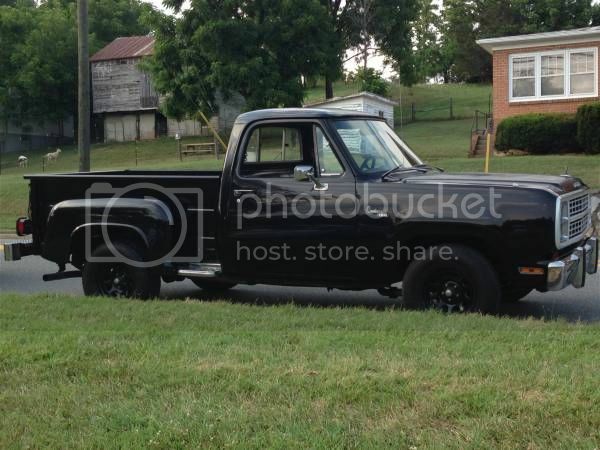 Description:I have a 1979 Dodge Warlock II pickup.I am the third owner of the truck and the previous owner had it for 32 years.He completely went through the whole truck in 1994.Engine is a 318 2 barrel that was rebuilt when truck was redone.The engine has around 10k miles on it and runs excellent.Every nut and bolt was replaced on this truck when it was redone.The cool thing about this truck is it was ordered as a factory 4 speed truck with a solid bench seat.When the previous owner had the truck re done he never put the Warlock striping back on but it can be bought off the net for $275.The ONLY thing wrong with the truck is the hood and driver side fender need painted.I wouldn't be afraid to get in and drive anywhere in this truck.Insurance appraisal on this truck AS IS is $12,500 or $25,000 in perfect shape. Located in Staunton,VA.Looking for muscle cars,diesels,jeeps,trucks.Trade must be of equal value unless you add cash! Last edited by shenandoahcrwlr; 08-17-2014 at 12:40 PM. Make some trade offers guys!!! I have a 1965 impala convertible I might consider trading, inbox me if you're interested.